If you want to know if a tornado is developing, observe wall clouds closely. A rotating wall cloud is a strong indication that a tornado is on the rise and you need to take cover immediately. Get to know more about this cloud phenomenon on the following paragraphs. Wall clouds refer to the gigantic lowering clouds on the base of a thunderstorm cumulonimbus cloud. These clouds mark the inflow side of the thunderstorm which is on the south or southwest side. When viewed from a distance, many of them show rapid upward movement and cyclonic rotation. A wall cloud indicates the area of strongest thunderstorm updraft and a rotating wall cloud signifies the intense thunderstorm updraft and forthcoming funnel cloud formation. However, not all wall clouds exhibit rotation and eventually dissipate. How do Wall Clouds Form? Wall clouds develop due to the rising and converging of air inflow into the thunderstorm’s updraft. It occurs when the updraft (or rising warm air) of thunderstorm ingests moist air. As moist air is entertained within the updraft, it condenses as soon as it rises. It may also form from rising scud that condenses and organizes. If you observe a persistent wall cloud lasting from 10 to 20 minutes and showing a strong cyclonic circulation and intense surface inflow, then a tornado is developing. At What Height is Wall Clouds Found? A wall cloud appears on the underside of the thunderstorm cloud. Therefore, it can be found at elevations not greater than 6,500 feet from the Earth’s surface. What makes this cloud phenomenon remarkable among storm chasers is that it is rain-free, which means there is no rain that will fall from them. The reason behind the wall cloud’s rain-free base is due to the upward movement of air into the cloud which keeps rain from falling from them. That is why the wall cloud and the possible tornado are visible. Wall clouds may appear with associated features in the form of tail cloud and collar cloud. This cloud is often seen attached to most wall clouds appearing like shredded cloud bands and fractus clouds stretching from the wall cloud into the precipitation area of the thunderstorm. Collar Cloud is characterized as bands of clouds encircling atop wall cloud where it converges with the ambient base of the thunderstorm cloud. It forms when a large amount of warmer air is pushed upward and condenses forming a collar-like structure on top of the wall cloud. How do Wall Clouds Look Like? These clouds generally appear like a spherical patch of cloud with shredded bottom edge. It is much smaller against the base of the cumulonimbus cloud with only a 2-mile diameter, a fraction of a mile wide to more than 5 miles across. How common are Wall Clouds? 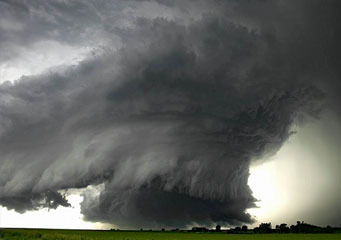 Wall clouds occur in most parts of the globe. However, they are very common in areas that experience severe thunderstorms and tornadoes like the United States. Wall clouds are very common in the Central Plains in the U.S because its geography is conducive for breeding of severe thunderstorms and tornadoes. This area is often called the tornado alley and storm chasers flock their way to these places to witness dramatic and menacing cloud formations and study tornadoes.